You know, of course, that the Crusaders could be rather nasty types, given to wholesale bloodshed with the excuse of serving their masters, the Popes, and accumulating indulgences to keep them out of trouble in this world and the next. Silly boys! They would have done better had they learned a bit more about how to layer and honey a nice baklava, or the many lovely accompaniments to pita bread and felafel. Maybe next time. 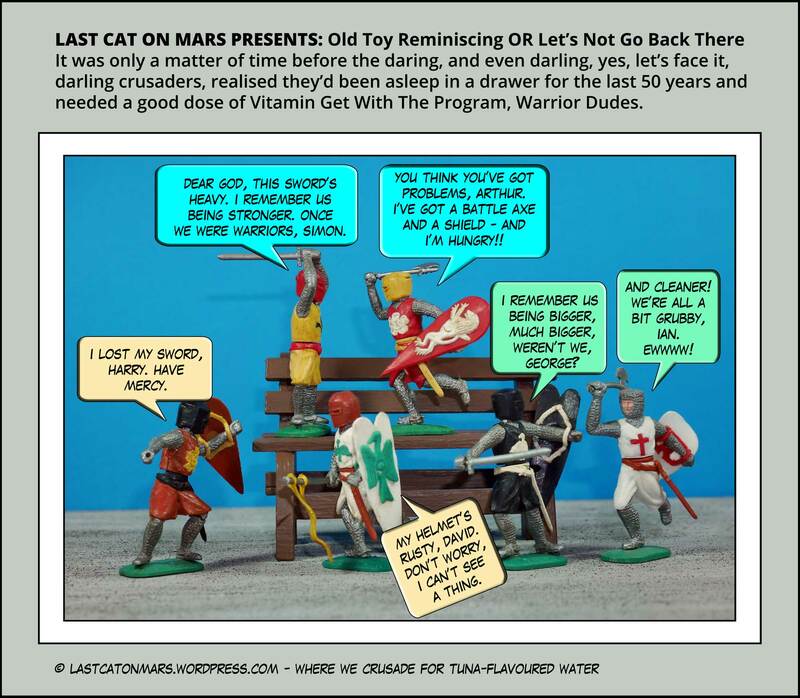 This entry was posted in Variety Show and tagged bench, cartoon, comic, crusaders, old toys, retro on September 20, 2017 by Jay Verney. Euclid – it’s all his fault, friends. Far be it from me, or meow, to finger an ancient angler, but hey, why not? Personally, I like the odd shapes and I’m guessing you might, too. Euclid is known as the ‘father of geometry’ – imagine giving all those sharp little shapes and corners and angles a kiss and a hug before bedtime. Imagine the damage to the porcelain at bathtime as a 45 degree introvert collides with its obtuse over-achieving sibling. What fun, eh, Pythagoras! The sofa, by the way, is a lovely replica of a design by Irving Harper who worked for George Nelson’s company. It’s called a marshmallow sofa – positively edible. Thanks to the talented Lorrie for her miniature replica and permission to use in this presentation. 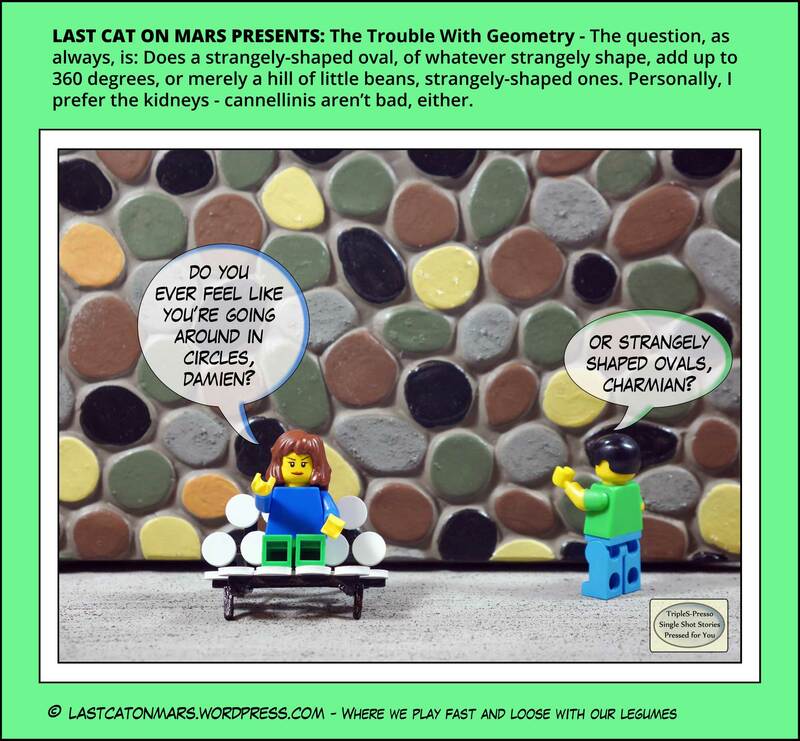 This entry was posted in Variety Show and tagged cartoon, circles, comic, geometry, lego, marshmallow sofa, minifigures, retro lounge, rock wall on September 6, 2017 by Jay Verney.